Today we are going to learn how to wrap gifts creatively. 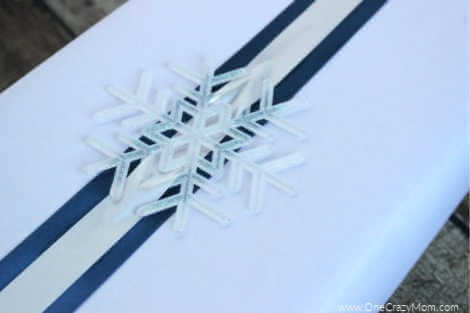 Learn a new Christmas Gift Wrapping Idea to use this year as you start wrapping your gifts. I am going to be honest with you – wrapping presents is not my most favorite thing to do. I love shopping for just the right present and I love looking at pretty presents under the tree, but I just don’t like spending time on wrapping presents. Please tell me I’m not the only one! If you read my post about using Tulle instead of ribbon, you know I am all about cheap and easy gift wrapping. 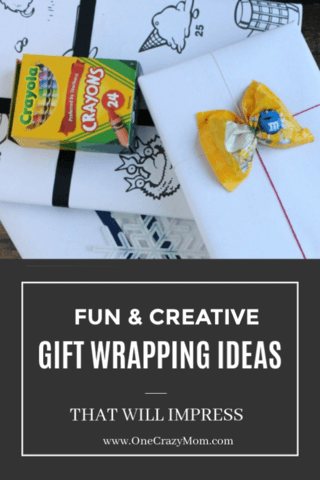 That being said, I want to share 5 more creative Christmas gift wrapping ideas that I love – and I hope you’ll love, too. Do your kids have any giant coloring books? I mean the super over-sized books that are the size of 2 or 3 coloring books? My kids have a couple and they love them. It is just so much fun to color on a gigantic piece of paper! Thinking of how much my kids loved these giant sheets, I thought, “Why not wrap a present in it?” The paper is big enough for a variety of presents. 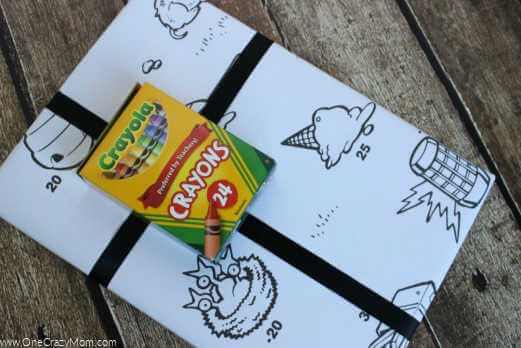 To me, this would be the perfect creative gift wrapping idea for a gift for a budding artist. I even included a package of crayons as the topper instead of a bow. If you want to add a little more color to the wrapping, you can always have your kids color the sheet before you wrap the present. If you don’t have any extra large coloring books, Amazon has a nice selection and I know I have found some at Walmart before. What’s that you say? Candy? That’s right! I said candy. 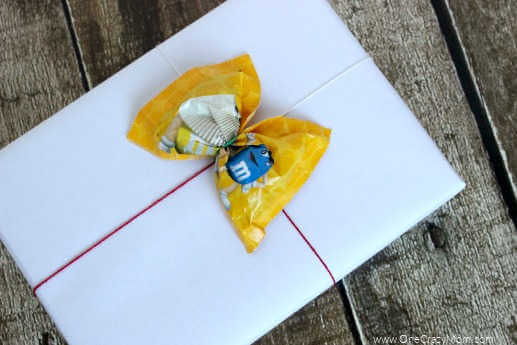 Have you ever noticed how a package of candy, when cinched in the middle, looks like a bow? I think this is going to be my new favorite way for wrapping kids’ presents. I simply wrapped the gift in white butcher paper and wrapped colored string around it. Then, I wrapped a length of string around the middle of the package of candy until it took on the shape of a bow. You can either tie or tape on your candy bow to the front of the package. I used a snack size package on this smaller gift, but a larger bag of candy would look just as cute! I bought a roll of white paper a couple of years ago from Mardel and I still have a bunch. You can find it on Amazon, too. This is A LOT of paper, so it will last quite a while! There is something about brown paper packages that just screams beautiful simplicity. It’s nostalgic, isn’t it? At my house we always have brown paper on hand because our local grocery store (Crest) still offers paper bags. I choose paper every chance I get. All I did was cut the bottom off the store bag and then cut the length of paper I needed for my gift. Once I wrapped up the gift (words facing in, of course), I wrapped bright ribbon around the package and finished it off with a simple loop. Do you want to know another thing I love about this wrapping? 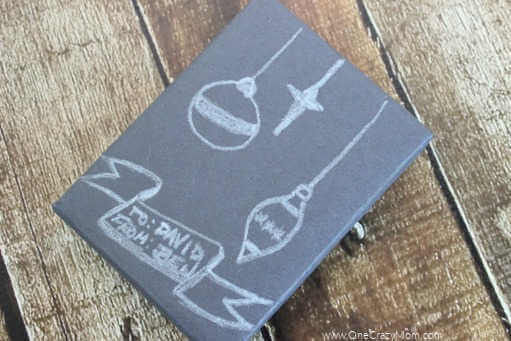 You don’t need a gift tag – just write directly on the wrapping! Talk about simple. These colorful permanent markers work great for writing the names on the packages. My package was small enough that I just used a piece of black construction paper, but you can also buy black paper on the roll if you think you’ll want to wrap a lot of your packages this way. Since most ribbon colors won’t show up on black paper, I used a white crayon to create a simple, yet elegant design. 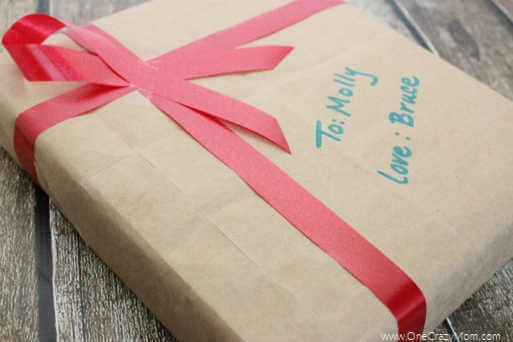 As with the brown paper, this wrapping also serves as your gift tag as well! The crayon worked well, but it obviously dulls with use. If you were going to wrap several packages this way, you might also want to buy a white gel pen. This will give your gift a more finished look. 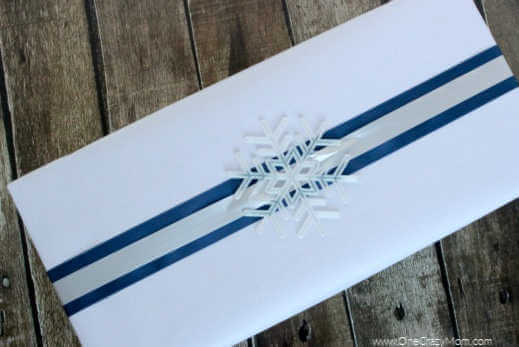 For a more “fancy” look, grab some snowflakes and ribbon and start wrapping! Don’t you just love this wrapping? I almost think it looks like fancy store wrapping (but without the cost). For this look, I wrapped the entire package in white paper. Then I used 2″ wide dark blue ribbon and strung it down the middle of my package. I bought a package of about 10 snowflakes from Dollar Tree for only $1. These are plastic snowflakes, but they are so pretty (and glittery). I weaved the 1″ wide ribbon through the snowflake and then centered it all on the wider ribbon. That is it! I just love this creative gift wrapping idea. Doesn’t it look so fancy? It literally took me 3 minutes to wrap this, but I just love it! If you can’t find snowflakes at your local dollar store, you can find some on Amazon, they just cost a little more. You could also tie on a Homemade Christmas ornament. 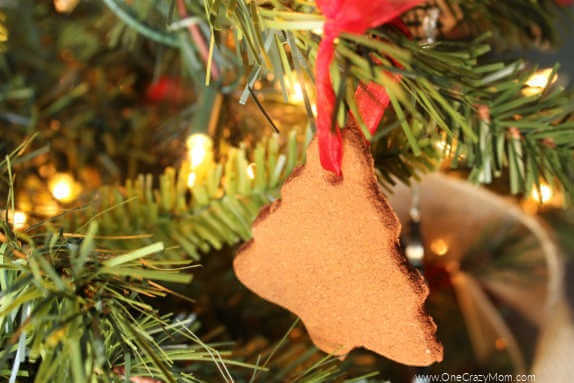 In fact, these homemade Cinnamon Ornaments would be beautiful tied on a present. 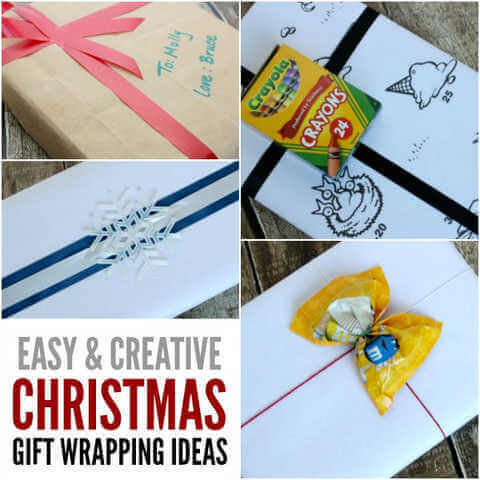 There are so many creative Christmas gift wrapping ideas! 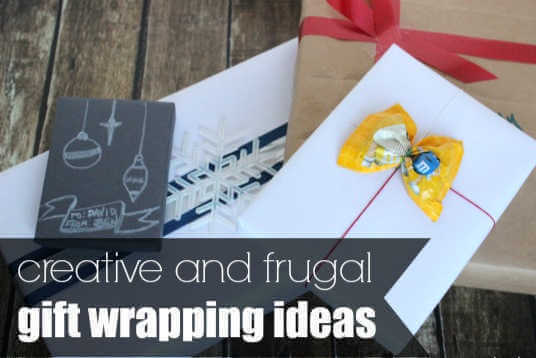 Try some of these fun gift wrapping ideas instead of purchasing store bought wrapping paper. It is so fun to wrap a holiday gift in brown kraft paper. Think outside the box and decorate the paper with fresh greenery, jingle bells or even polka dots. Use a little baker twine and attach a candy cane. We even use card stock for a gift tag. The finishing touches like a pom pom look so pretty and attach easily with a dab of hot glue. These gifts will look beautiful underneath the Christmas tree. Plus, getting creative and thinking outside the box with wrapping paper is eco friendly! You will have a blast and these step by step instructions make it so easy. 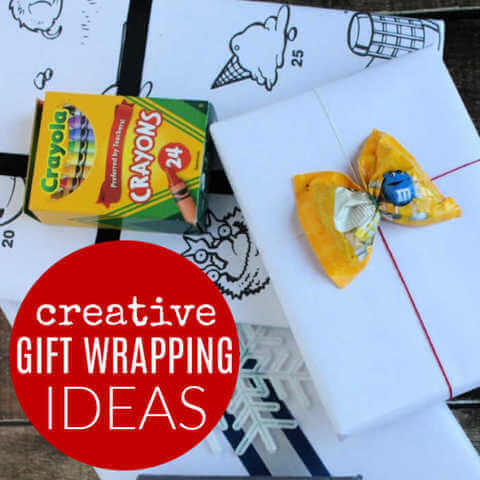 We love these Christmas gift wrapping ideas for kids and the entire family! Try some of these new ideas and you will love the impact they leave on your gifts. 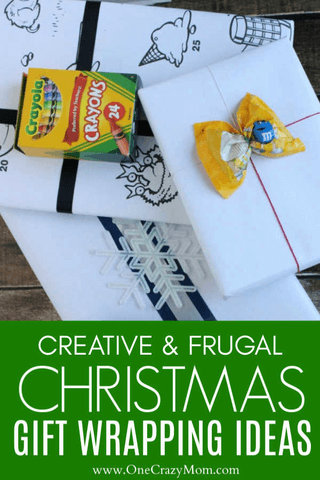 Some of my favorites include gift wrapping ideas ribbon and more. You can even use comics for funny gift wrapping ideas. It is so easy with all of these gift wrapping ideas step by step ideas! Whether you are looking for gift wrapping ideas for her or gift wrapping ideas for him, these are sure to be a hit! Which of these Christmas gift wrapping ideas do you plan to try? You know the candy bows and snowflake wrapping are my favorites. Let us know what you like here or what you already do with your presents. We can’t wait to hear all about your Christmas wrapping ideas! While the holidays are a fun time to spend with your kids, entertaining them so you can do some Santa work can be a challenge. 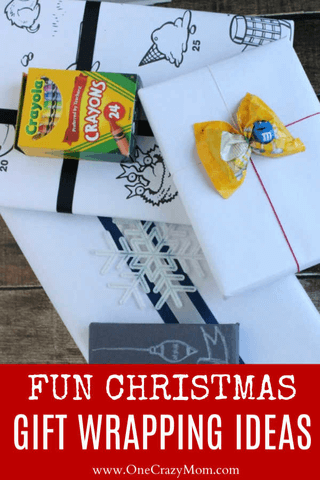 Find lots of fun Christmas activities for kids that are perfect for your children and so much fun!